Rugged & stylish. The Cross Country Hammoclk gives full coverage for your back seat. As with he rest of the Cross Country Collection the quilted microvelvet cover and sporty faux leather accents provide style, comfort and function. Tufting throughout the entire cover prevents fiberfill from shifting . Microvelvet fabric repels pet hair, spills and washes easily. 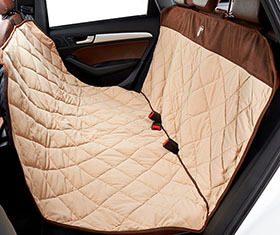 It's unique design to create a secure fit for a wide rangle of vehicle types and seat sizes. Simply attach the Hammock in place around the front and back seat head rests using the adjustable nylon straps and side release buckles. To Clean: Machine wash and dry on cool setting. Quilting prevents the fiberfill from shifting and clumping. NOTE: Almond out of stock until Jan 7. Seat Back 26" x 54"
Seat /Front 38" x 54"